Greetings friends! We're going to both close out a relatively light week and kick off December with something a little different... a little bit flashy... a little bit enchanted. 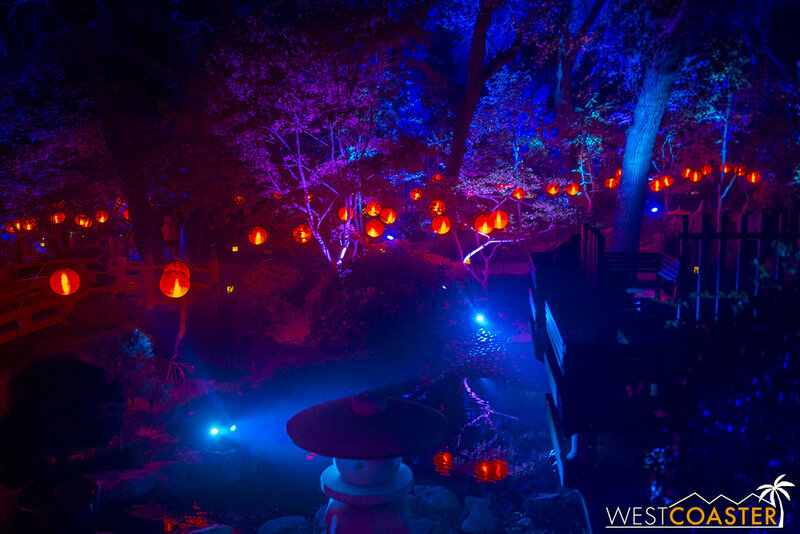 Today, we take a trip up to the foothills, north of Glendale and Pasadena, over to La Cañada, California, for a visit to Descanso Garden's special, extravagant, nighttime holiday illuminated event. 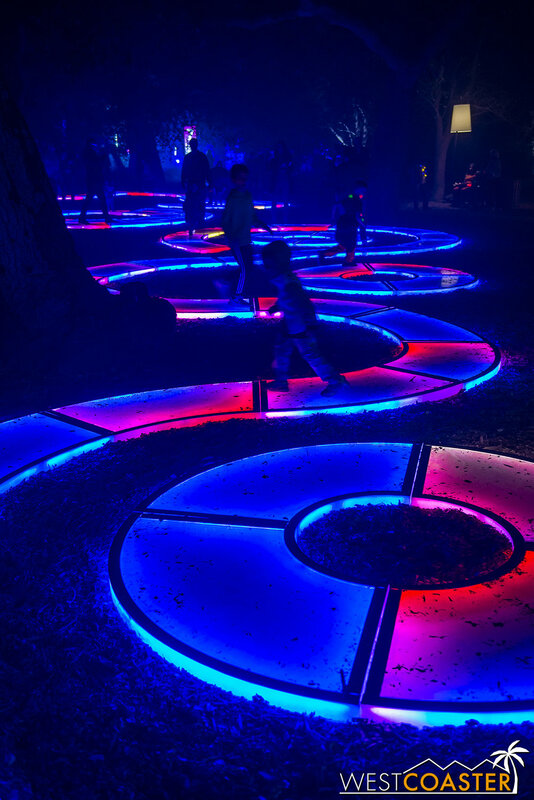 Enchanted: Forest of Light debuted last year as a wondrous, colorful, dazzling display of nature and lighting--a beautiful way to spend an evening at the famous botanical gardens. 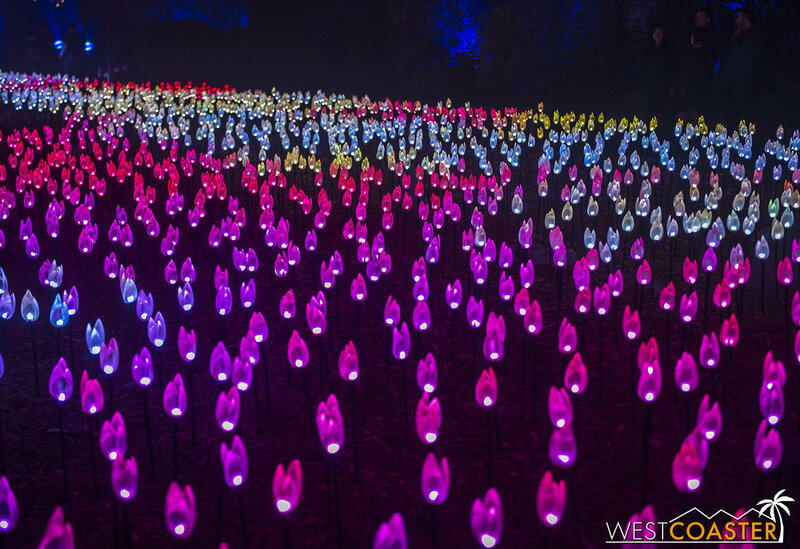 Combining art and nature, this special seasonal event certainly brought forth awe-struck crowds, and it was no surprise that it returns this year. By day, Descanso Gardens is a 150-acre botanical garden located on the former land of Spanish Corporal Jose Maria Verdugo, who received it from the first colonial governor of California. The property eventually transferred to E. Manchester Boddy in 1937. The owner of the now-defunct Los Angeles Illustrated Daily News built a 22-room, 2-story mansion and amassed a sizeable collection of camellia, rose, and lilac plants, and when he moved out in 1953, he sold the estate to the County of Los Angeles. Today, the gardens are run by a group of volunteers under the Descanso Gardens Guild moniker. 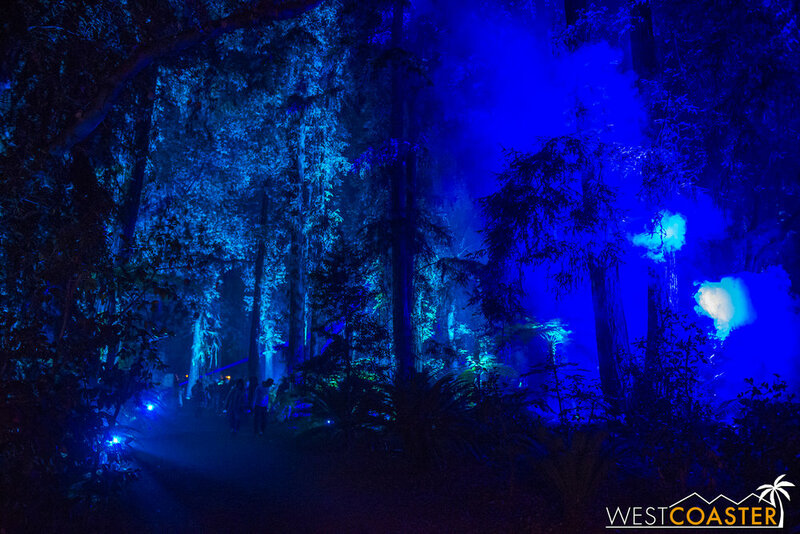 We took a trip to see Enchanted: Forest of Light last weekend. The experience is organized into ten separate zones, each with its own name and story. They are numbered in a rough suggested order, though guests are free to travel in whichever order they like. 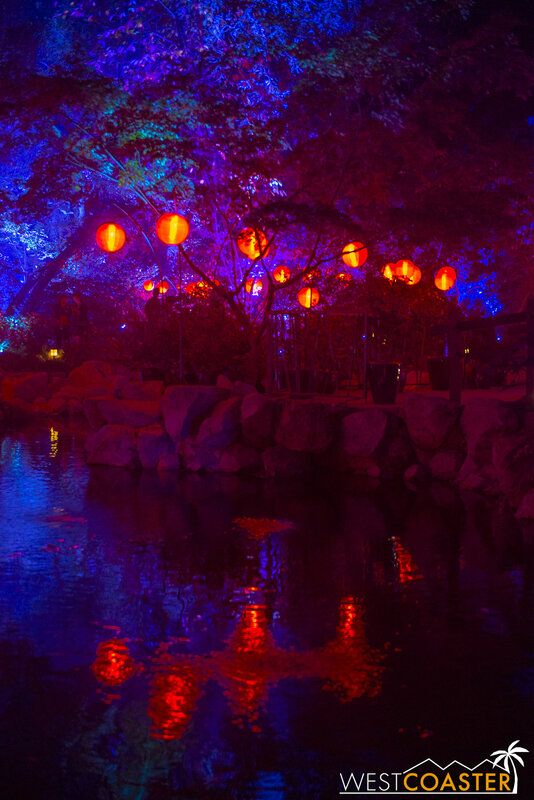 Lets take a look a this nighttime light festival, shall we? 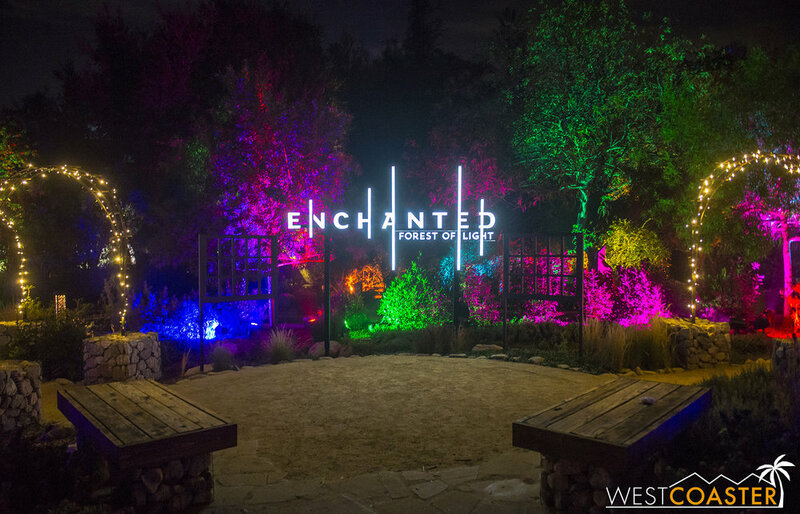 An elevated sitting area becomes a popular backdrop for guest photos, especially with the Enchanted: Forest of Light signage glowing so elegantly. The colorful changing background makes for a beautiful seen. 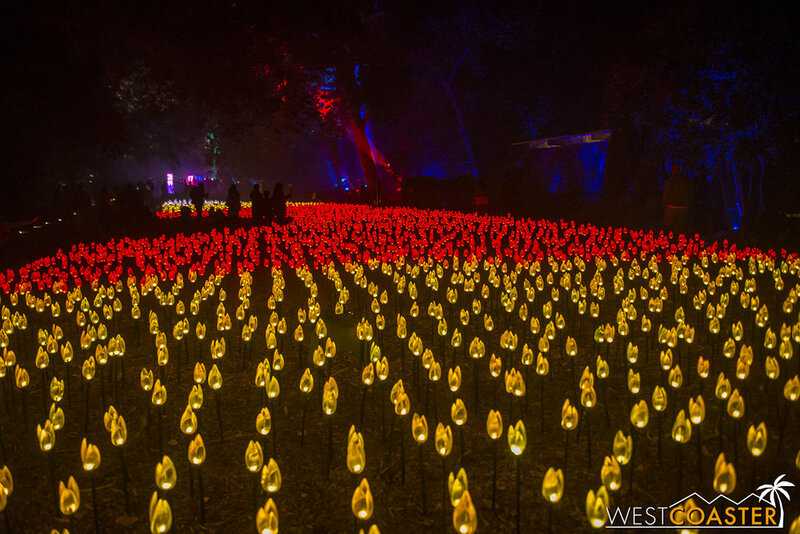 Enchanted immediately starts out with a bang, as Flower Power brings a dazzling carpet of radiant tulips that create a sparkling cascade of colors, shimmering and changing to reflect the cycle of the four seasons. All the while, a serene soundscape of chimes emanates through the air. Photos honestly do not do this exhibit justice, because the visuals are dynamic and constantly shifting. 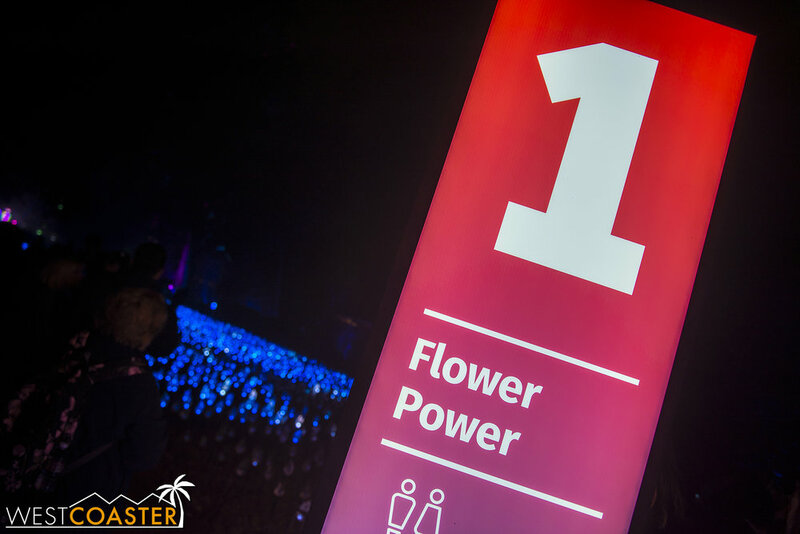 Flower Power is the first display guests encounter after they enter Descanso if they move toward the right, and it's often a lingering point for those who just want to take in the ambiance. It's very much quite spectacular! 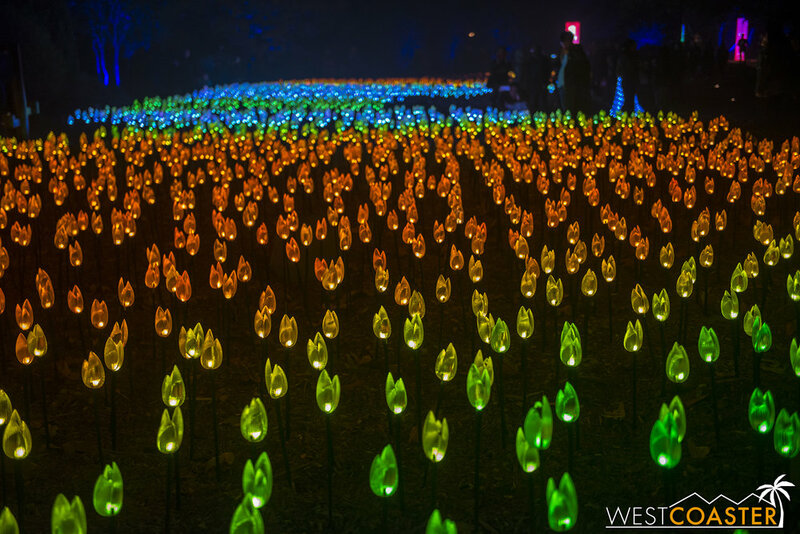 A serene spectrum of color flows through this tulip field. The colors shift and change organically and tranquilly. Perhaps the only negative of Flower Power is that it becomes a very tough act to follow, and as a result, Rainbow Sycamores seems disappointing in comparison, after the expectations set up by its preceding exhibit. 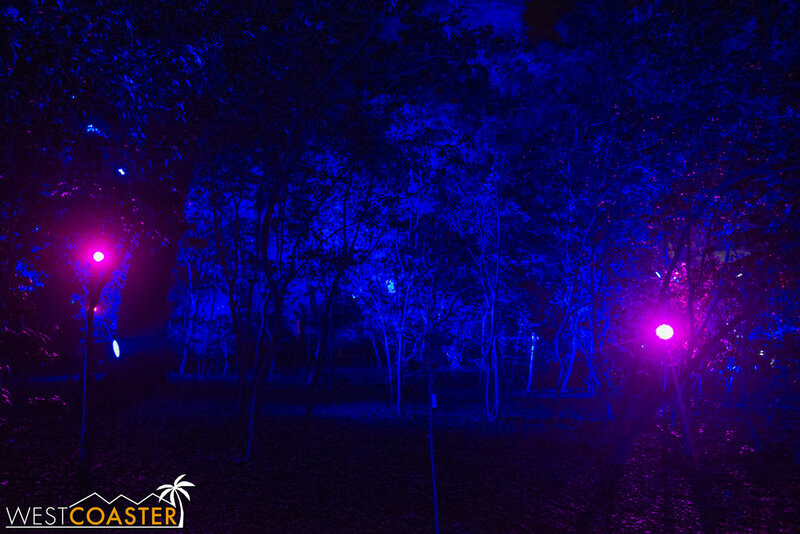 This second area is very small--just four light tubes that change in colors, illuminating the stately sycamores that surround this miniature grove. The interactive nature of this area is pretty neat, and it definitely attracts the attention of the curious--especially among children. But whereas Flower Power is a station one can spend an extended time contemplating and meditating, Rainbow Sycamores carries a shorter attention span. Guests are invited to touch these cylindrical color columns, altering the light and hue and changing how the surrounding trees are perceived. 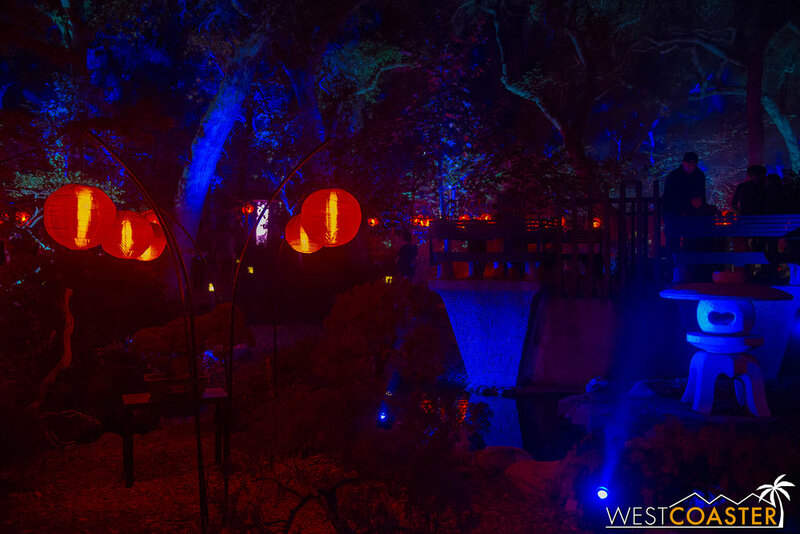 Next up is Starlight Garden, main comprised of an arched trellis curving along Descanso's daytime Rose Garden. The hanging spiky starred light fixtures are quite charming and quaint (and can also be purchased at the gift store for $35 or $39 per fixture, depending on the size). The walkway portion is not too long, but I found the adjacent Celestial Shadows exhibit, by HYBYCOZO, to be far more fascinating. These geometric shapes--some grounded on pedestals and others free to spin and twirl--explore light and shadow through abstract artworks. 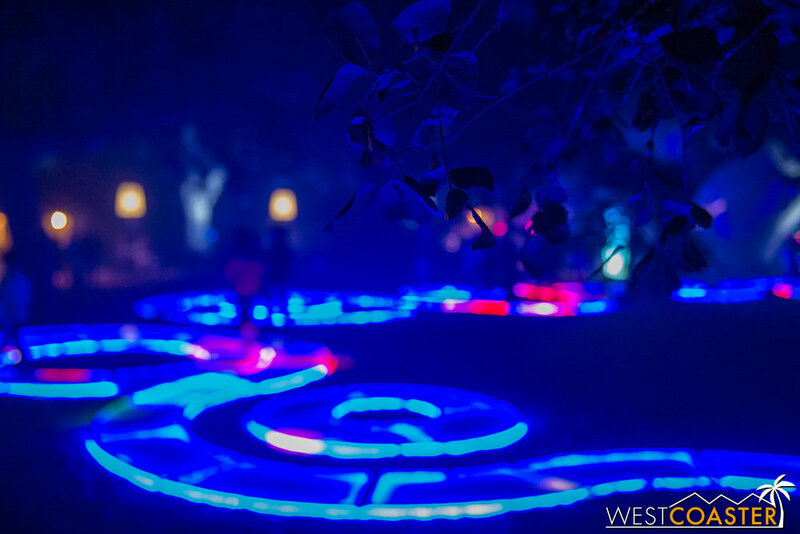 The hanging lanterns invite an interactive twist, and the cast patterns on the ground create a mesmerizing (and sometimes dizzying) display of dynamic art! Hanging star-shaped lamps provide a celestial feel to the Rose Garden. The accompanying Celestial Shadows exhibit plays off geometry, light, and shadow. From an observational standpoint, Lightwave Lake is similarly short term. 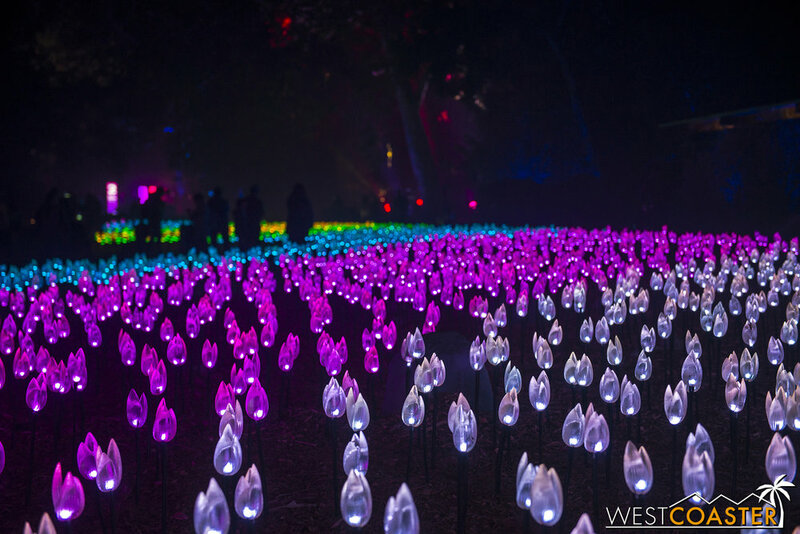 The lake itself normally acts as a reservoir for irrigation water, but by night, guests can control the orientation and color change of a series of sweeping lights located on the far shore. The distant nature of the actual lights stands as a sharp contrast to the intimacy of pretty much every other area, and it would have been nicer to provide some closer lumieres. 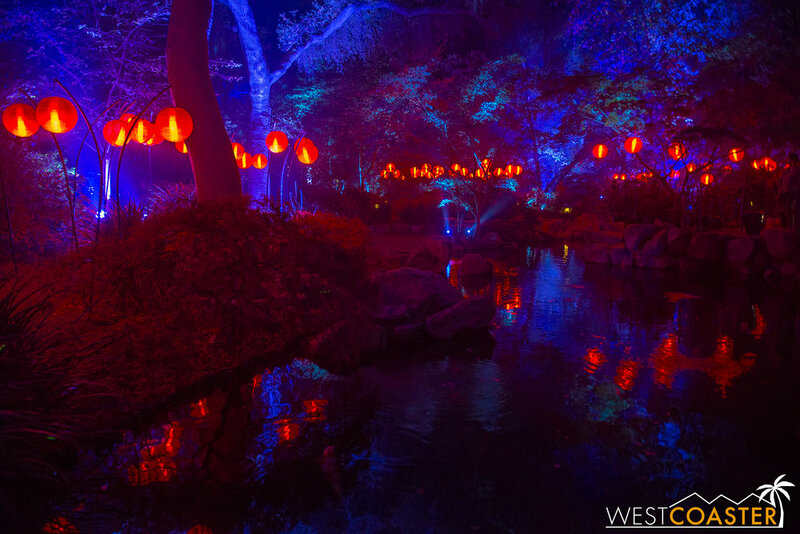 But just beyond the lookout of Lightwave Lake is a collection of glowing orbs that provide their own forms of art. The attract the gaze and attention of many a guest and make for photogenic scenes from certain vantagepoints. 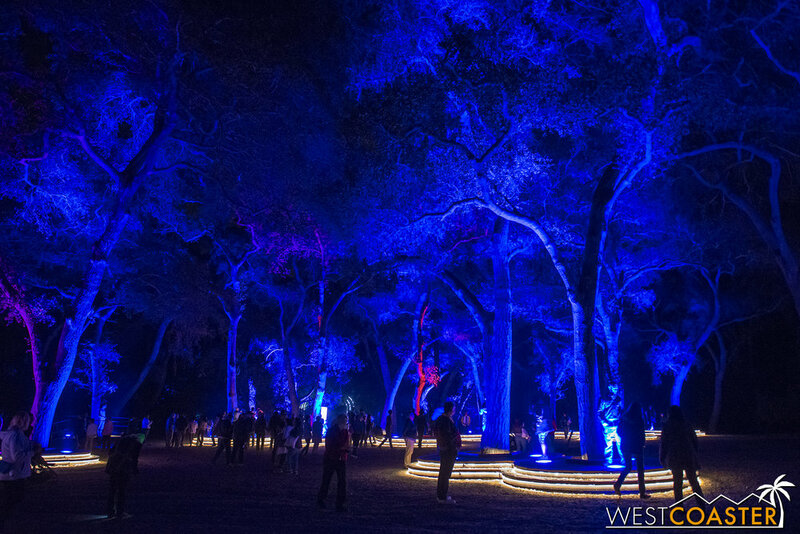 Next is the majestically lit grove that is the Symphony of Oaks. 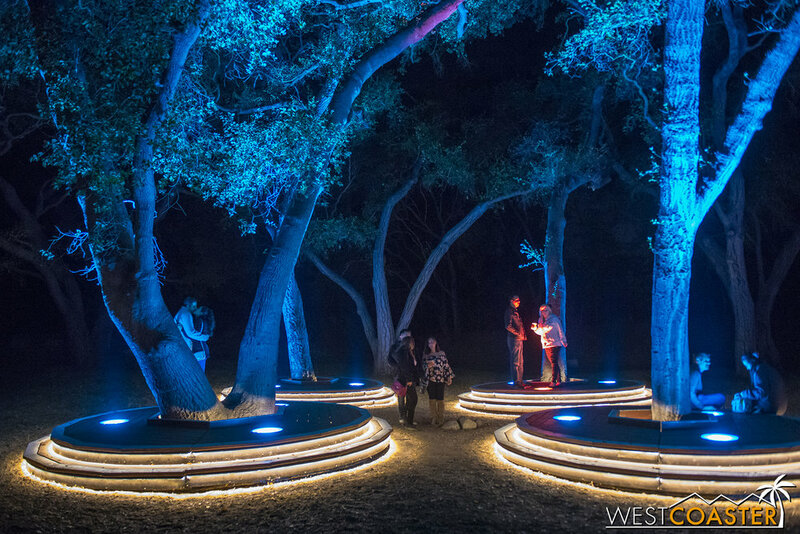 Filled with coast live oak trees, this clearing features a series of ringed platforms with uplight discs that change color upon pressure. 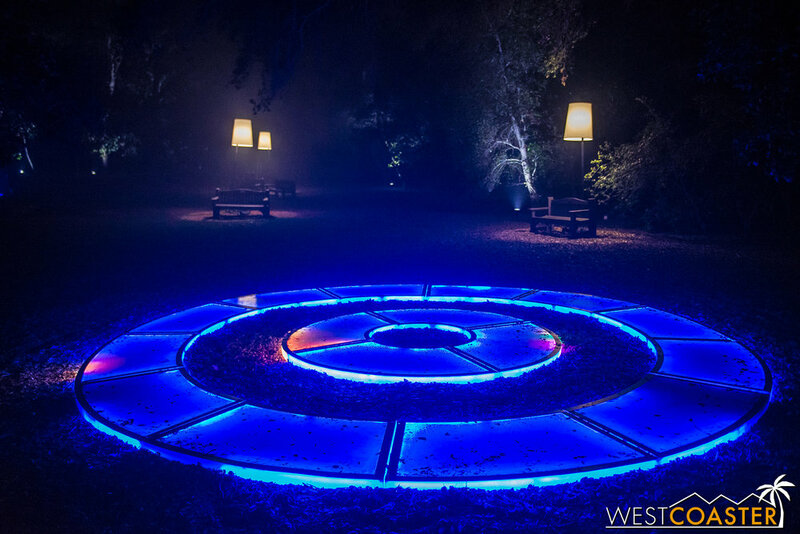 Guests can make these lights "sing" by jumping on them as they go around each platform in a circle. 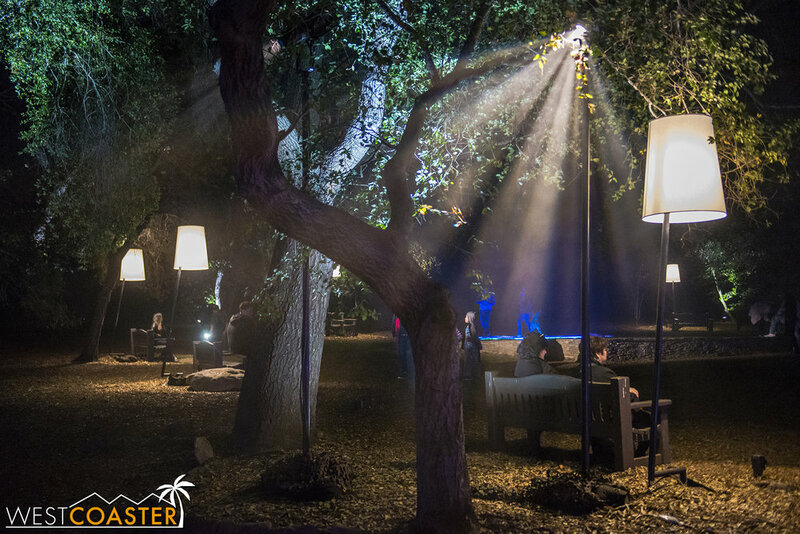 The ambiance here is incredibly ethereal and makes for a romantic spot as well. The forest almost becomes a cathedral of sorts, and the environment is quite wonderful. 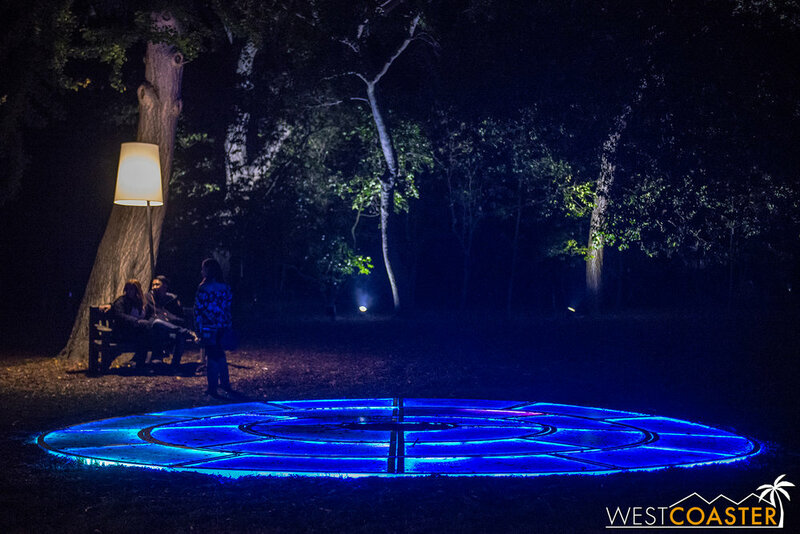 The circular podiums are ringed with cove lights that really create a nice floating sensation! Almost as if to pace the experience, Fantasy Forest follows the Symphony of Oaks as another shorter, almost interstitial space. 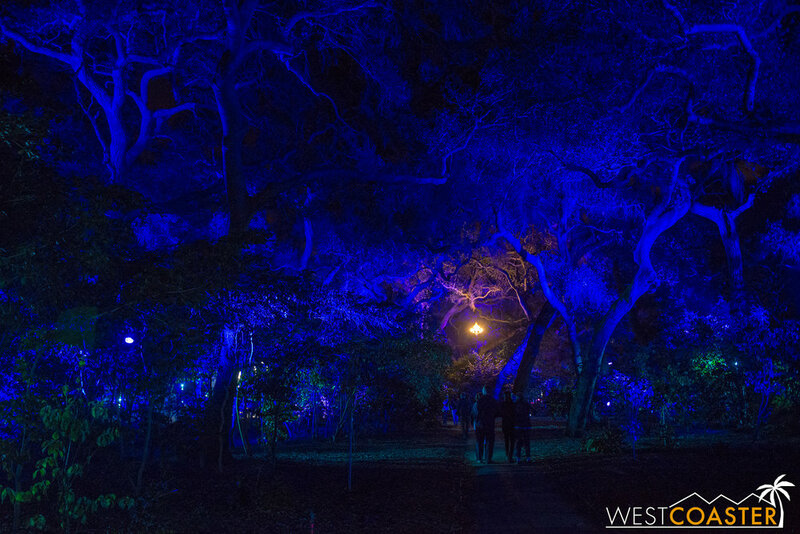 A series of slender, semi-arched bands of light mark a pathway that passes through Descanso's famous camellia plants. 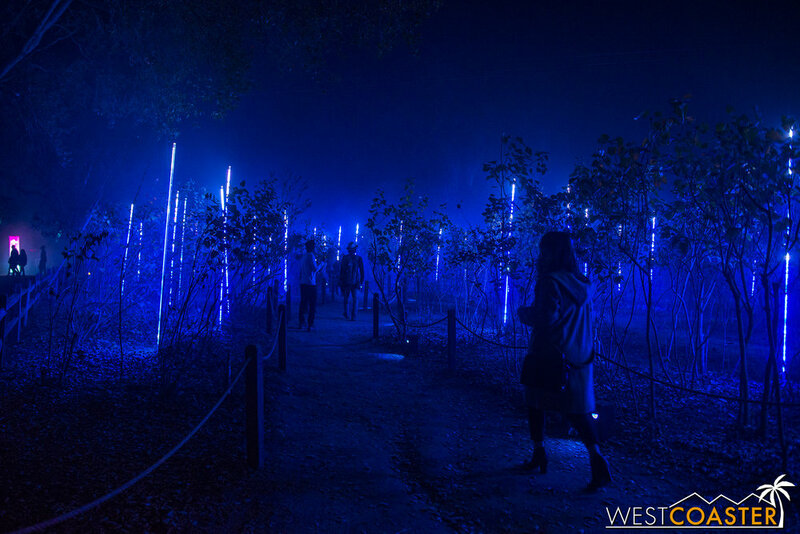 The area holds an important role in this botanical garden's history, but the Fantasy Forest area itself ends up largely functioning as a mass selfie area, because the even, clean whites of the diffused LED's provide plenty of illumination, and the arrangement of these inverted glowing "hockey sticks" make for interesting shapes. Still, compared to the more prominent and extensive zones, area 6 is a little bit underwhelming. 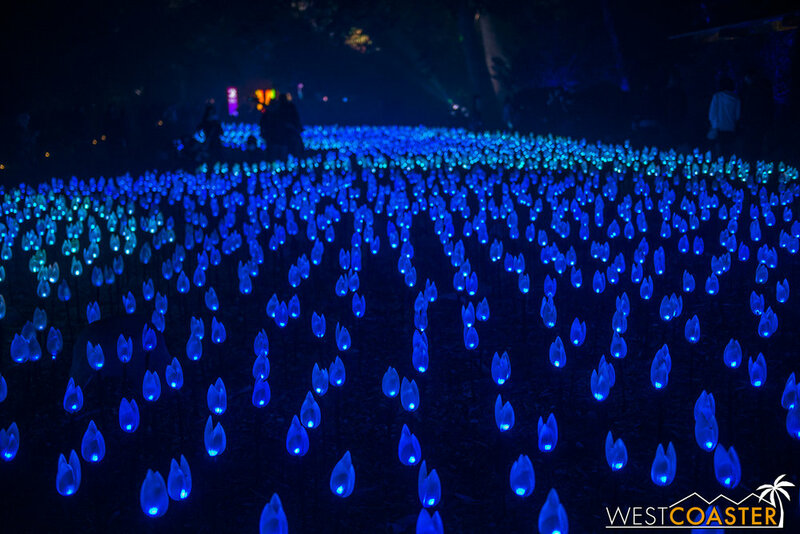 Fortunately, another unique and creative and interactive area immediately follows in the form of Luminous Lawn, which also features a whimsical and lovely art installation called Aqueous by artist, Jen Lewin. 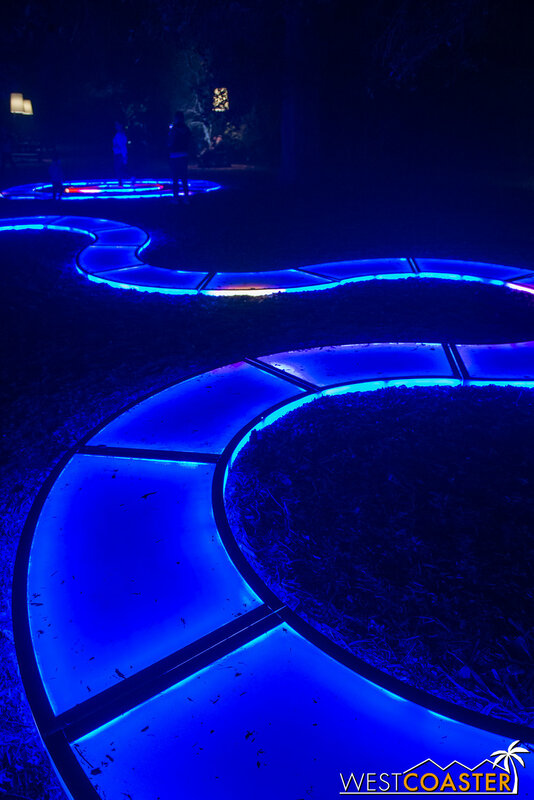 These curving bands of light-up sidewalk almost feel like strolling through a giant, luminous version of the Candy Land board game. They seem to attract the interest of kids, who often gleefully weave their way through the layouts. Just beyond, a series of benches and oversized living room floor lamps light scattered sitting areas on the edge of the forest. These form nice juxtapositions of islands separated from the winding pathways. 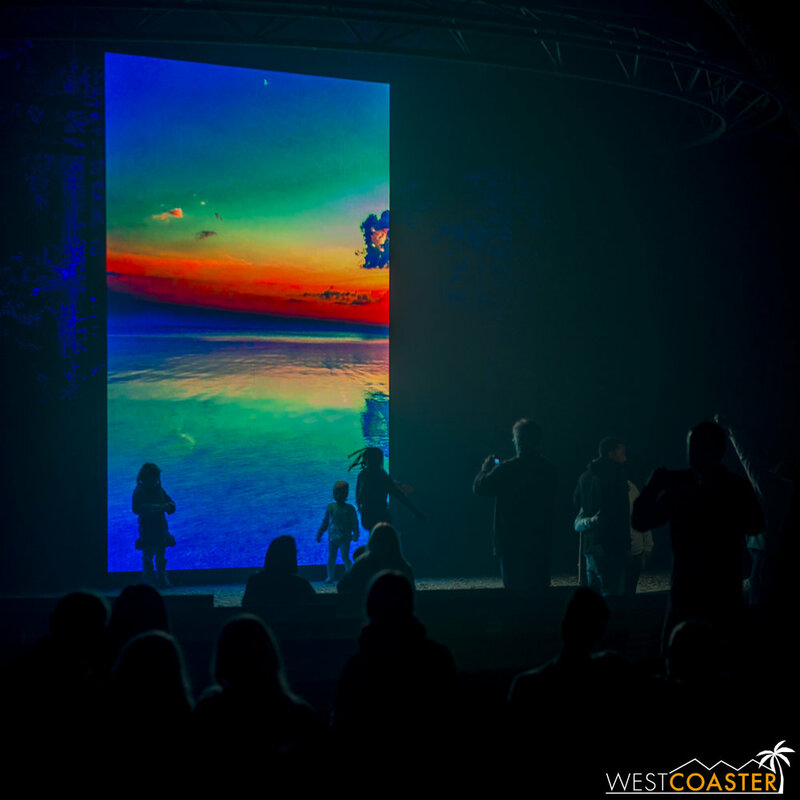 And just between this general area and the Garden of Good Fortune, a large video display tower projects abstract scenes of nature and the interstellar and patterns in front of a small outdoor theater space. It's all quite lovely, to be sure! Colorful, winding panels invite exploration through the forest. A collection of outdoor "sitting rooms" of sorts lines the perimeter of the lawn. 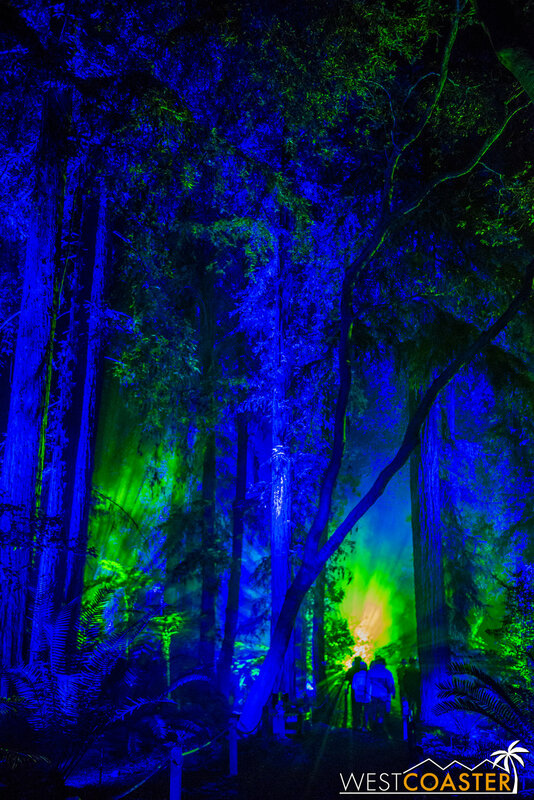 Perhaps the most surreal portion of Enchanted: Forest of Light is the Ancient Forest, which is so dramatically lit that one feels like this is a scene ripped straight from a movie. 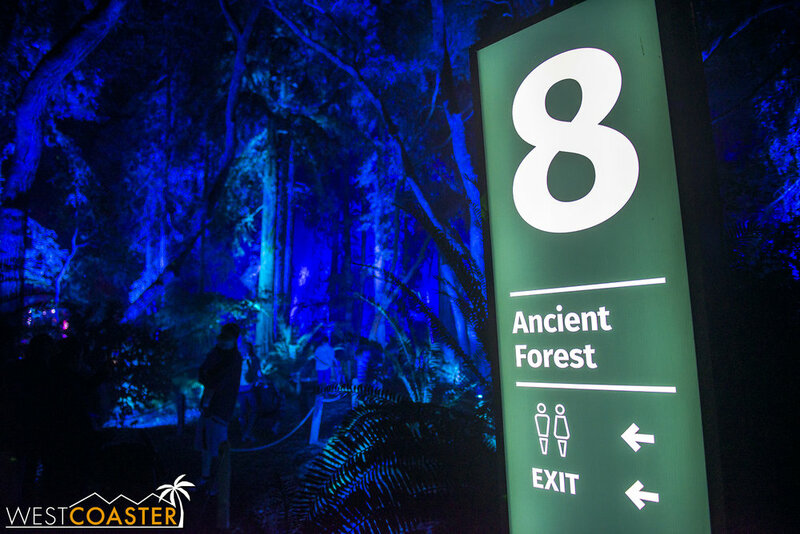 Guests must first make their way through a laser-projected firefly medley of woods before finding the Ancient Forest properly. As they continue through, a mysterious soundtrack accompanies a pattern of shifting lights. 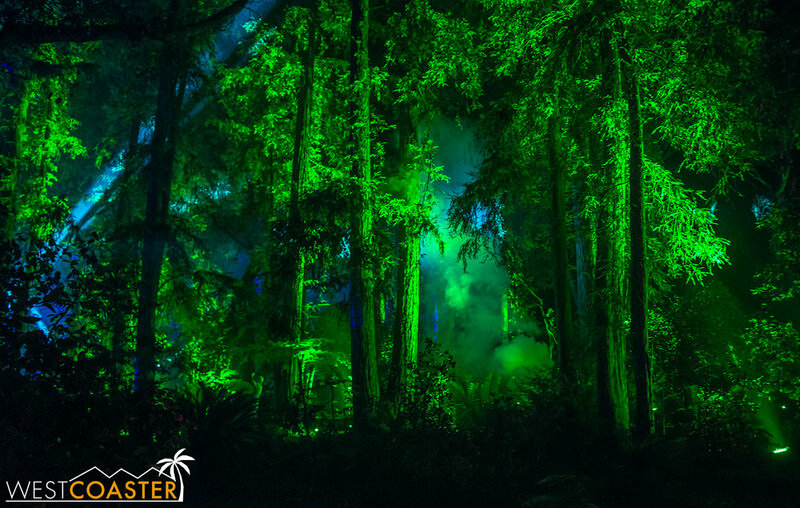 As spurts of fog punctuate the ephemeral atmosphere, Ancient Forest crafts a pretty incredible ambiance all around--one that truly feels like it has traveled back in time! This is definitely one of the most impressive exhibitions of Enchanted. It's hard to resist just waiting until a dinosaur appears, so evocative is the scene! Though this is a real and very old forest, the lighting gives it a theme park ride or movie set feel--if only because the environment feels otherworldly! 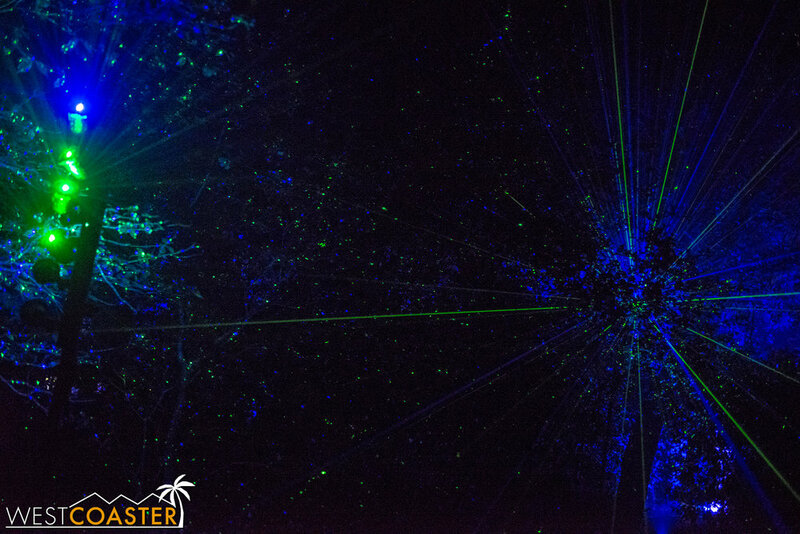 A laser firefly field cast onto the trees creates a green, starry canopy. 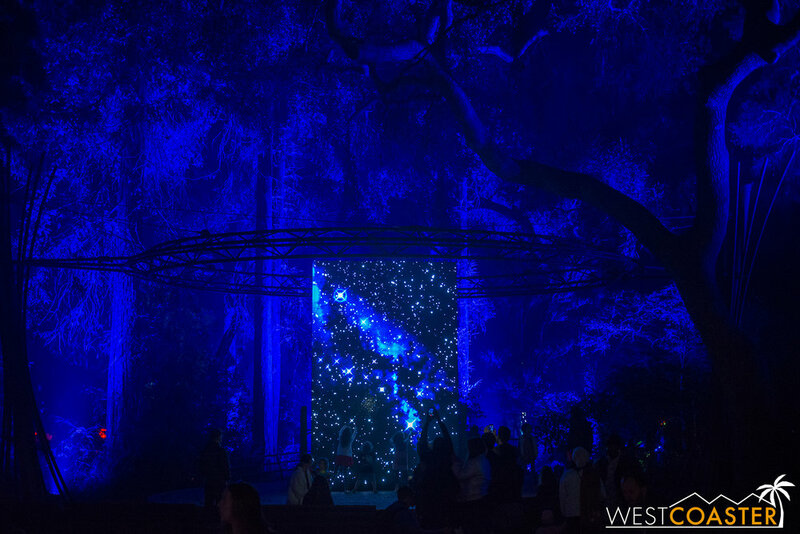 From most impressive to most disappointing, continuing past Ancient Forest to Pixel Grove brings forth another of the more underwhelming offerings at Descanso's winter nighttime event. The home of the lilac garden is meant to convey a "psychedelic wonderland," but what's really accomplished is a short jaunt through a road of glowing reeds that slowly change color but lack much variety or pizzazz. It makes for not much time spent sticking around. Pixel Grove really isn't even that pixel-y. Rods of light cover what is normally the Lilac Garden. 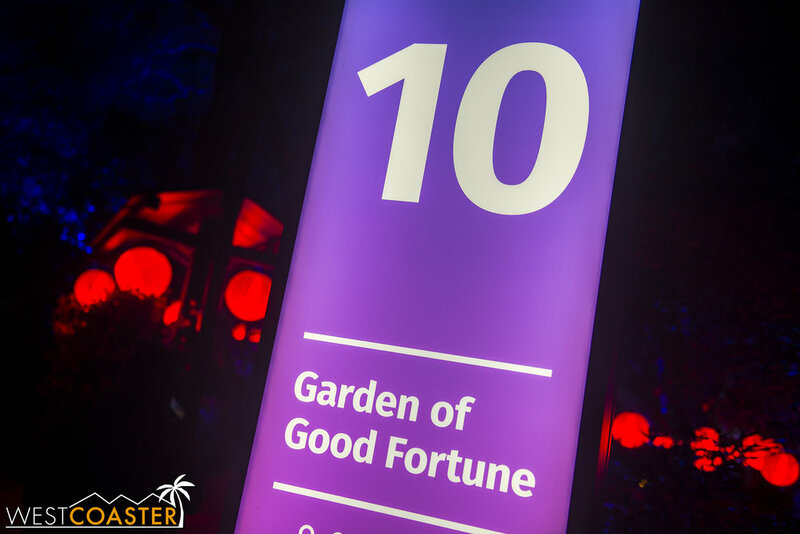 Finally, guests turn back toward the park entrance for the Garden of Good Fortune, a Japanese Garden littered with hundreds of glowing red lanterns and cool purple trees. This area is very much meant to be a moving experience for guests, as pathways and bridges bring them through and around the garden. There are moments for rest--an elevated shrine deck area and a sitting area provide moments to pause and take in the view. Likewise, some of the bridge direct guests toward visual frames of the Japanese landscape. It's a pretty strong way to end the Enchanted experience. 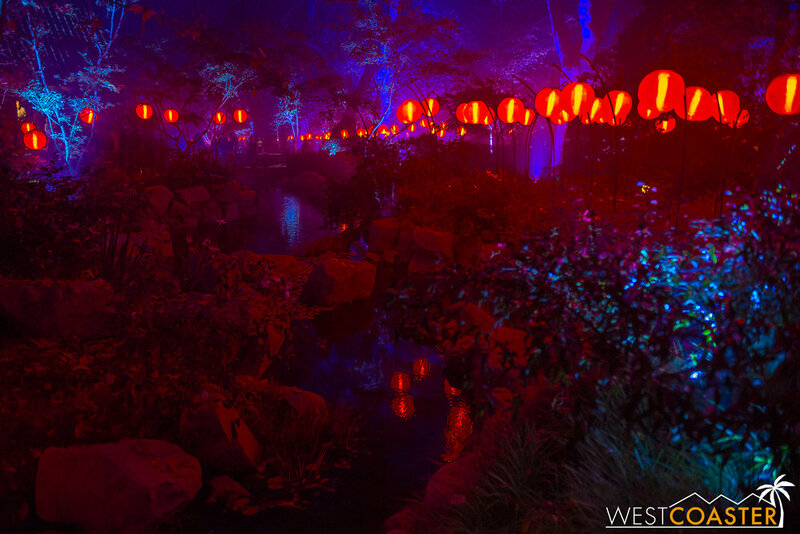 Red lanterns litter the Japanese Garden and give it a warm, passionate light. Water features add to the photogenic nature of this space. 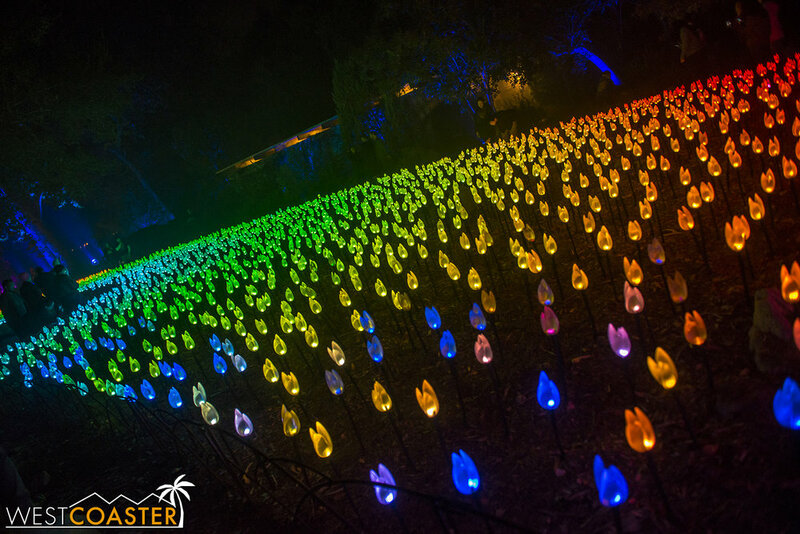 Ultimately, I found Descanso Garden's Enchanted: Forest of Light to be a fantastic and unique winter experience that combines art with eye candy with nature. It's certainly a great date place, with countless photo ops for couples and plenty of romantic settings. Families will enjoy this event too, because it appeals to the inherent acceptance of wonder that we all have. The interactive aspects of many of the "outdoor rooms" also brings some fun to the gardens. There might be a pervasive line of manufactured magnificence here--after all, in real life, nature is hardly so theatrically cast--and the event is certainly conducive to satisfying those seeking opportunities "for the 'Gram," but ultimately, it's a charming and delightfully dazzling attraction that well merits a couple of hours (or more) visit. Plus, one can't help but commend the smart manner in which a botanical garden has figured out how to up profits during the winter, when flowers and plants are typically not in bloom and thus unable to provide actual attraction for the the garden! 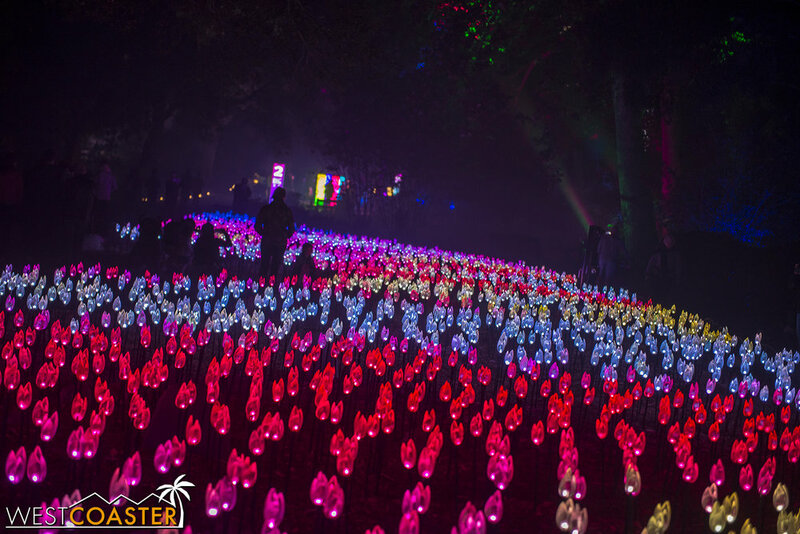 Enchanted: Forest of Light runs through Sunday, January 7, 2018 for this season. Tickets can be purchased online and includes general admission or admission and dining combos. Descanso offers a unique and alternative holiday activity, but one that is extravagant nonetheless. I'd definitely recommend checking it out if you have a free evening this holiday season!